Dragon Boat racing for fun, sport and recreation. The festival showcases Asian and multiculturalism in Edmonton. Grab your spot in a boat or come cheer the participants on as they rip down the mighty North Saskatchewan river. Each dragon boat is led by a drummer who produces a rhythmic drum beat, or the boat’s “heartbeat”, which keeps the paddlers in sync as they battle neck-and-neck with their rivals down the river. 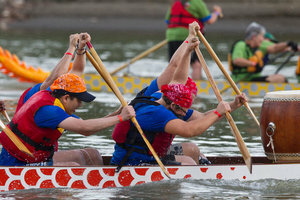 Teams take great pride in decorating their dragon boats to intimidate the competition. Pick your favourite team early and cheer them on right to the finish.